Concert Flor-de-Lis: Flamenco & Italian music in Galeria Luz de la Vida in Competa! Tuesday April the 23rd at 9.00 p.m. musicians Natasja La Valletta and Bart Guichelaar-Villerius, better known as Flor-de-Lis, will give a concert in Galeria Luz de la Vida, during the Art Walk in Cómpeta. Bart and Natasja live partially in Árchez as well as in the Netherlands. They are professional musicians with a Flamenco and an Italian repertoire. During this special concert they combine both music styles. You will be taken on a journey from passionate and intense Flamenco to delightful light Italian music! The superb 7 piece tribute to Santana, Jingo Experience will be performing at La Cochera Cabaret in Malaga. Tickets €12 on the door . -14th – Mrs Miggins Home Bake Sale at La Vega. Orders being taken now for all our usual fayre. Black Eyed Peas come to Torre del Mar: Award-winning band The Black Eyed Peas, in their original line-up, including will.i.am, are playing at this year’s Weekend Beach Festival in Torre del Mar which takes place between July 3 and 6. This is one of only three concerts the band is playing in Spain this year. 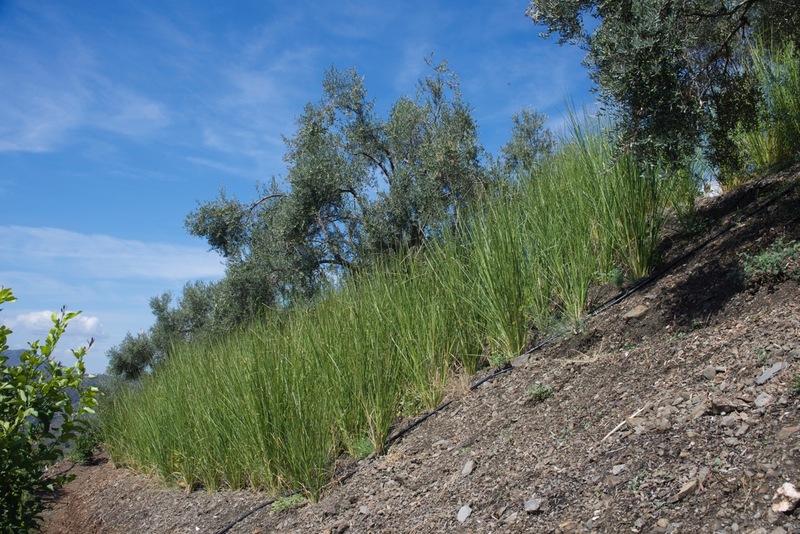 Vetiver Spain: March is the best time of the year to plant Vetiver. After planting Vetiver for almost 10 years now we know that the best results are when Spring comes around. This way Vetiver has a full spring and summer to absorb the heat of the summer. This plant is indigenous to India and loves the heat. For Sale: 3 Genuine Radley Handbags. I have 3 beautiful ladies Radley Handbags for sale in excellent condition for €40 each or all three for €100. From Torre Del Mar, can meet locally. Thank you. Elisha. Friggy in Coca Cola TV advert: Frigiliana was chosen to shoot Coca Cola’s newest television advert. The mountain town now appears in a one-minute campaign broadcast across all national television networks and online. The advert was filmed at the beginning of February on Frigiliana’s Calle Santo Cristo, and shows diners enjoying the brand’s drinks overlooking the town’s views. -The prices for a new copy of Windows 10 on the Microsoft website have gone up despite many writers suggesting there would be discounts as the end of Windows 7 approaches. New prices: Win 10 Home €145, Win 10 Pro €259. Have you made your System recovery disk image yet? If your hard drive quits you don’t want to have to buy a new copy of Win 10! Go to Settings/Recovery for instructions. -Windows has now “recommended” no computers more than 3 yrs old be upgraded to Windows 10, they say you should buy a new computer before Win 7 goes obsolete in 9 months. Here are some new quotes from Microsoft’s Support page. Oh, and they want you to buy your new laptop from them or one of their sponsored distributors (BestBuy/Walmart/CostCo/Amazon). -Many new computer processors will only be able to run Windows 10. Not Windows 7/8.1 or Linux. If you want to use these alternative systems you will have to buy a model that is Linux compatible, and you will pay more for this privilege (a monopolistic move by MS to crush the competition). If you want Win 10 but think you may ever want to use Linux (as Win 10 clamps down on 3rd party software and finds ever new ways to invade your privacy), be sure to buy a “Windows 10 + Linux compatible” laptop. -DoctorLaptop, for all your computer repairs find my contact info in the Sponsor’s Section below.